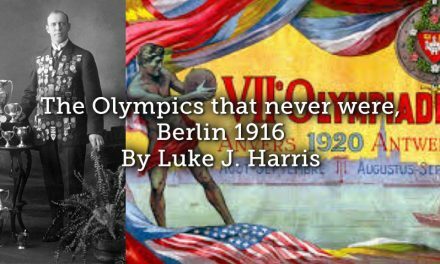 During the invasion of the German troops the first days of the Great War the name of Sportwereld was changed into De Telegraaf-Sportwereld. A remarkable fact here is that the sports journalists started to operate as war correspondents. During the four years of German occupation in Belgium no Tours of Flanders were organized. All sport manifestations on the public roads were forbidden and the local population was prohibited to cross the municipal boundaries without any written authorization. However, sports and cycling in particular moved from the public roads to playing fields and velodromes. 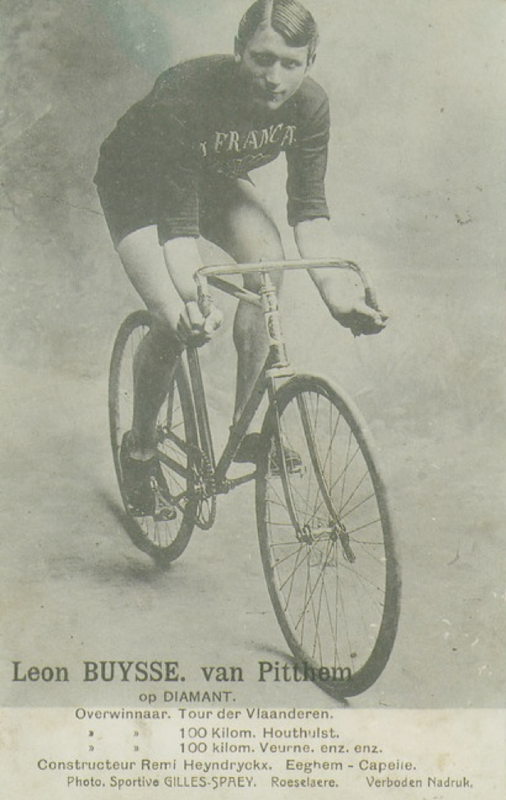 On 22 August 1915 a surrogate ‘Ronde van Vlaanderen’ was competed with a distance of 150 kilometers in the velodrome of Evergem, and also on 23 July 1916 in the velodrome of Gentbrugge. The track was drawn on a map and the race was imaginary simulated in the velodrome. All regulations remained the same as during the real races. The racers had to repair their own bicycle during technical failures. At the passage of a check point in a ‘certain city’ they had to stop and have their application form stamped. Only then they were allowed to take new spare material and have some food and drinks. 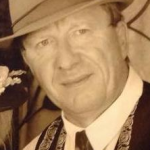 Both races were organized by the director of Sportwereld, Leon Van Den Haute, who lived in Ghent during the war. Karel lived in Torhout near Bruges, a garrison town in Operationsgebiet (Ops area – frontal zone) with even more stricter rules, so any collaboration to this event of his part was impossible. 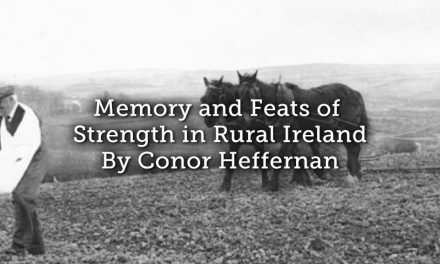 From 1916 the Germans introduced forced labor to the local population. Karel was put to work in the construction of the German airfields in Torhout until he was recognized by a German officer : cycling champion Walter Rutt. Karel was ordered to stop working immediately and send home. After the First World War Karel Van Wijnendaele started over his activities for Sportwereld in 1919 that got immense popular during the twenties with editions up to 200.000 copies and special releases like the Geïllustreerde Sportwereld (Illustrated Sportsworld). During the thirties even a daily newspaper Het Algemeen Nieuws (The General News) was added. Sportwereld was the only Flemish written sports press in Belgium until the late thirties. 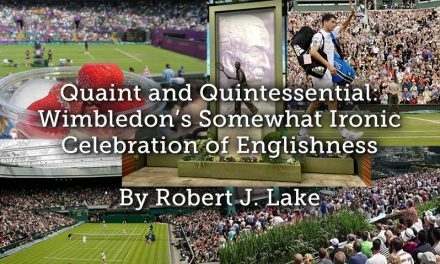 A lot of other newspapers envied its success and her journalists whose sports articles appealed to the imagination of the readers. In 1925 Karel Van Wijnendaele became co-owner and after the death of Leon Van Den Haute on 23 Februari 1931 owner of Sportwereld. 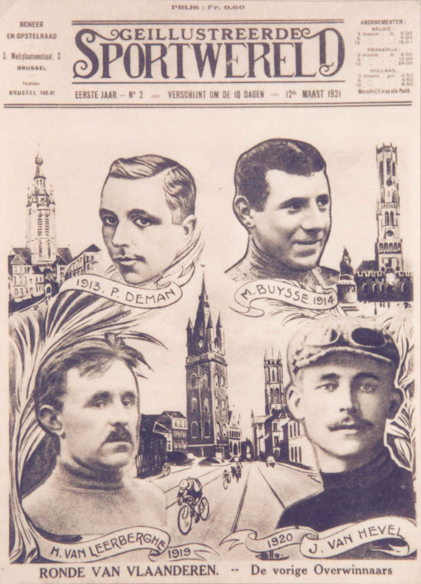 The frontpage of the ‘Geillustreerde Sportwereld’ of 3 March 1921 with the winners of the first Tours of Flanders : Paul Deman in 1913, Marcel Buysse in 1914, Henry Van Lerberghe in 1919 and Jules Van Hevel in 1920. 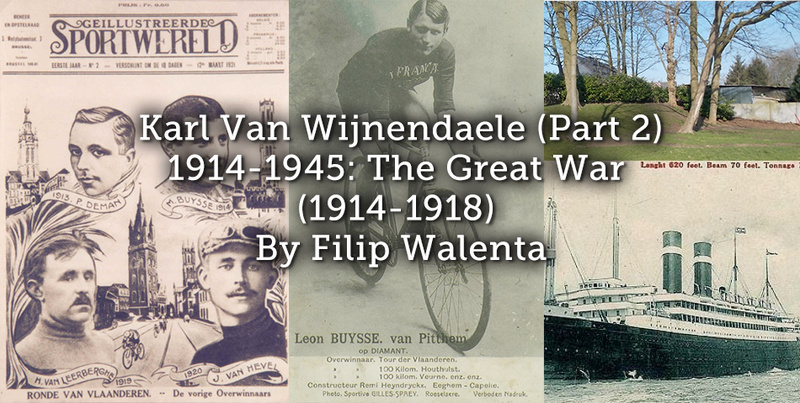 Only a few months after the Day of the Armistice Sportwereld organized the Tour of Flanders again in 1919 with a new race-course introducing the first hills in the Flemish Ardennes and finish in the velodrome of Gentbrugge. 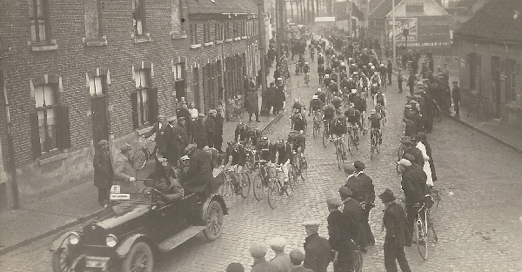 The start of the Tour of Flanders of 1923 in Mariakerke with Karel Van Wijnendaele standing in the car. From 1920 till 1938 the coast line was followed during the first part of the race. The headwind would provide a first selection and create bordures in the peloton as the racers rode towards the hill zone. During the twenties the Tour was not considered as a classic race, the best foreign cyclists preferred to participate at other races like Paris-Roubaix and Paris-Bordeaux. But a decade later the Tour was organized a week before Paris-Roubaix, consequently participation of all the cycling champions was ensured. The two races would grow and become famous as the cobblestone classics of the North. In 1920 Karel and his Flandriens were invited by John M. Chapman to participate at the New York Six Day Race in the United States. 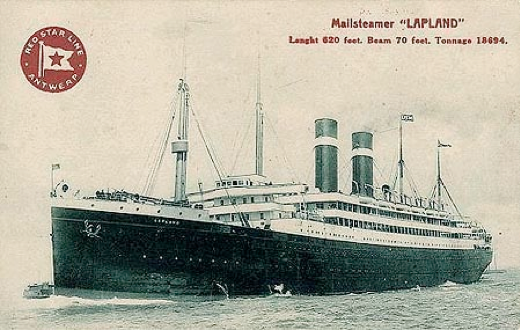 They traveled from Antwerp via Southampton to New York on the steamer SS Lapland of the Red Star Line. The Red Star Line was a Belgian shipping company that brought more than two and a half million European immigrants, searching for a better life, to Northern America during a period of more than fifty years (1873-1934). When self-interest of the racers became more important than the interest of the Flandriens, Karel had to dissolve his team in 1923. But the myth of the Flandrien was born and would become cycling heritage. In 1930 the rules in the Tour of France changed significantly, the private teams were replaced by national teams, and the Belgian cycling union asked Karel to lead the national team to victory. The Belgian national team won the Tour of France in 1935, 1936 and 1939. During winter time Karel also was co-organizer of the Brussels Six Days and referee in de Antwerp Six Days for four years. When finally halfway the thirties other newspapers payed more attention to sports news, the market share of Sportwereld gradually dropped. After decreasing profits Sportwereld was sold to the Standaard group, and became the sports section of Het Nieuwsblad-Sportwereld (The Newspaper-Sportsworld). Due to the construction of the Atlantic Wall, a row of bunkers at the French and Belgian coasts, the passage of the Tour of Flanders at the coastal areas were prohibited by the German occupier during the Second World War. The finish line in 1942, 1943 and 1944 was replaced to the velodrome ’t Kuipke in the center of Gent, where the Ghent Six Days still are organized. In the mean time the Belgian cycling union (KBWB) made one mistake after the other. The tensions increased, and finally the KBWB split up in a Flemish and a Walloon cycling union. Karel Van Wijnendaele saw that the whole Belgian cycling world was at stake and took up his responsibility and became president of the sports committee. After the Liberation he was totally wrongly suspected of collaboration, but all charges were dismissed by lack of any proof at all. The repression was misused to regain the lost power position in the Belgian cycling union, to purify it of any members of the Flemish Movement and to settle old personal scores. Most of all Karel reacted with a personal thanks letter of Field Marshall Bernard Montgomery, for picking up English pilots in his house and repatriating them at his expense, risking his life and his family with deportation to the German concentration camps. It would take another two years until in 1947 Het Nieuwsblad-Sportblad was allowed to be published again. Slowly the Standaard group regained its position in the media and took over two local newspapers in the fifties.